Now that entirely entry level Blu-ray players can be bought for less than £100, manufacturers asking for more are having to work harder for their money. The BD-C6500 scores by engineering in some nifty features to justify a heftier price tag. 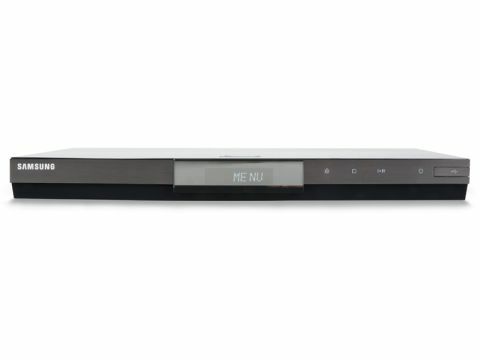 Claimed to be 'the world's fastest Blu-ray player' when it was launched earlier this year, the stylish deck supports BD-Live (Profile 2.0). Samsung's status as the world's biggest memory chip manufacturer enables it to build in 1GB's worth for no discernible premium, while USB storage is alternatively available. The front USB port, meanwhile, will accept a wide range of media, including video music and photos. Samsung's Internet@TV is accessible with or without Wi-Fi and brings a selection of web favourites – including YouTube, Twitter and Google – to your screen. Some of these widgets are pre-installed, but you can choose your own, as they are downloaded to the player and share the aforementioned 1GB with BD-Live data. A Samsung representative confirmed that catch-up services such as BBC iPlayer won't, alas, be included. However, you can play media stored on any PCs or DLNA-compliant storage devices on your home network. Other features here are as expected; you get support for 1080p/24, BonusView compatibility and the ability to handle high-resolution soundtracks. The 7.1 analogue audio output, an unexpected bonus, is ideal for older AV amps without HDMI connectivity. Another welcome discovery is that the C6500 can handle Blu-ray discs made with Panasonic's recorders. The C6500 is pretty nifty. From standby, the disc tray opens in less than three seconds. Insert an average disc, hit play and its menu appears onscreen within 45 seconds. Blu-ray players have got much faster in the past couple of years. However, our test disc of the Java-heavy movie 9 kept us waiting considerably longer. BD-Live can be ponderous, too, as witnessed by a spin of Moon, although internet speeds are influential here. For all but the most basic operations you'll need the remote, a substantial slab of a device with large buttons. Controls have been dedicated to functions such as BonusView, Internet@TV sites and popups. The handset will also operate some brands of TV (HDMI control, known here as Anynet+, is also supported). Without a disc inserted, the home menu is shown onscreen. This contains a well-organised batch of menus, including Internet@TV, music/video/photo playback and setup functions. So far, then, so good overall. Our positive impressions aren't let down by the visuals. Teamed with a Samsung full HD LCD set with 1080p/24 output configuration, pictures are nothing short of breathtaking. The superb Blu-ray transfer of Moon is a case in point. In the exterior shots you can pinpoint individual stars against the inky-blackness of space, while man-made artefacts and geological features are rendered with impressive detail and contrast range. The richly saturated hues of cockpit instrument panels, under the-surface griminess and the more subtle flesh-tones of the station's sole inhabitant, Sam Bell, are all grist to the C6500's mill. Also highly impressive is the fluidity of movement, which contrasts with the judder of early Blu-ray players. Switch the C6500 to 1080i, and such artefacting becomes apparent. However, it's thankfully less evident than it is with the older hardware. Decent DVD transfers stand their ground and Samsung's upscaling does an excellent job, with no untoward artefacting. Poor encoding is ruthlessly exposed. The same can be said of network playback; web video (notably YouTube content, which can only be viewed in standard definition) can look atrocious when upscaled for large screen TVs. At the opposite extreme, well-encoded DivX HD material is superb. We're disappointed that you can't cue or review through networked video. Another letdown is that digital photos can't be displayed in high definition. The C6500 takes high-octane movie soundtracks in its stride and conveys dynamism well. The more subtle arts of the sound engineer also fare well, as Moon amply demonstrates. After switching from HDMI bitstreams to the analogue 7.1 output, a subtle but noticeable drop in sound quality was noted with our Onkyo TX-NR905 AVR and Rogers 6.1 speakers. Although the placement and steering are still evident, the presentation is a tad less transparent and some of the finer sonic details are veiled. This trait is particularly noticeable with well-recorded music. Stick with HDMI if at all possible, then. With all the features on offer here, plus the decent design and quality performance, it's difficult not to like the C6500. The networking functions and multimedia playback can only boost the value for money that's represented here. If you have £200 to spend on a Blu-ray player, the C6500 should definitely be on your shortlist.